You would think that someone reporting in the midst of the ongoing Yemeni Civil War would be terrified. Twice, Iona Craig thought she would die. But never has she regretted her goal – to be the voice of the Yemeni people. 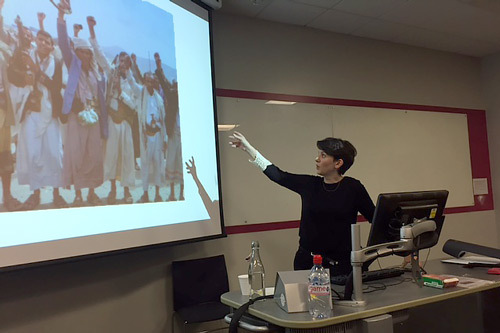 Returning to City, freelance journalist Iona Craig took time out of her busy schedule to deliver a well-received talk about her experiences reporting in Yemen. After thirteen years of horseracing, she came to City and graduated with a first-class honours Journalism degree in 2010. She had several internships during her time at university, including working for BBC’s Newsnight. “Work experience isn’t just about your CV,” she explains, “it’s about finding out what you don’t want to do, too.” For Iona, she knew that she did not want a restricted 9-to-5 office job. Iona arrived in Yemen in October of 2010, just in time for the Arab Spring. Despite initially working for the Yemen Times, as the revolution brewed, she left to focus on her freelance work and wrote for The Times as their Yemen correspondent. When the civil war began in March of 2015, she was the first journalist to get into the country. From systematic bombings of civilian villages and a dire humanitarian crisis fuelled by political instability and corruption, Iona has seen unforgettable images and scenes during her time in Yemen. “It became clear that there was no regard for civilian life,” she says. However, Iona’s dedication exceeded her worries. Despite being smuggled into Yemen’s southern port city of Aden from Djibouti by boat, making countless trips across the country in the dreadful heat and coming face to face with Al Qaeda, she does it because she is “passionate about it”. Iona has contributed to over 20 publications during her time in Yemen, including The Times, USA Today, Foreign Policy and VICE. She was awarded the Martha Gellhorn Prize in 2014, the Orwell Prize for Journalism in May this year, and the Kurt Schork Memorial Award for freelance reporters in September. Naomi Schanen is a second-year student on the BA Journalism programme at City, University of London.